The TICENT dog training collar is the perfect dog train system for First Time Pet Owners & Expert Trainers. With 330 yard/1000 feet range, this device was designed with the common household dog in mind (Small dogs, Medium dogs, Large dogs), as the range of this system easily accommodates a stroll to your nearby park, or training in the backyard. The TICENT dog training collar is designed to help fortify walking, leash training, sitting, and aggression, this e-collar has 1-100 levels to ensure a level is found that's perfect for your dogs. TICENT DOG SHOCK COLLAR - Comes with electric leakage protection, SAFE for your doggies. Perfect for First Time Pet Owners & Expert Trainers, can be used to help fortify barking, walking, leash training and sitting. 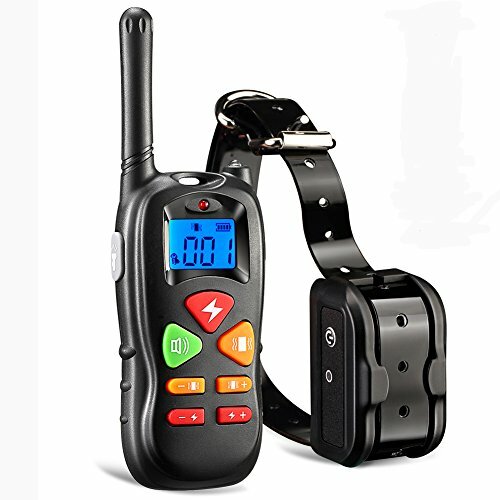 MULTI FUNCTION - Battery capacity display and low battery protection; 1-100 level of customization, three training types to help correct your dog's inappropriate behaviors. AFTER-SALES SERVICE - TICENT Dog Training Collar comes with a 1 year warranty and a 90-day satisfaction 100% money back guarantee!, if you're not completely satisfied, then CONTACT US and we will give you a 100% refund within 90 days of purchase. If you have any questions about this product by Ticent, contact us by completing and submitting the form below. If you are looking for a specif part number, please include it with your message.